Promising steps such as the drafting of the first-ever National Anti-Corruption Strategy in 2017 have been undertaken. Recently, the government has attempted to coordinate efforts to put the strategy in motion, at least at the national level. These worthy initiatives have however fallen short of making a significant impact and to convince the Nigerian public and the international community about the seriousness to fight corruption. To the huge frustration of the government, the last Corruption Perception Index in 2017 showed a slight deterioration in the scoring of the perception about corruption in public administration compared to 2016. Nigeria has slipped in the country-ranking by 12 positions in 2017, which shows that Nigeria is still perceived as extremely corrupt. 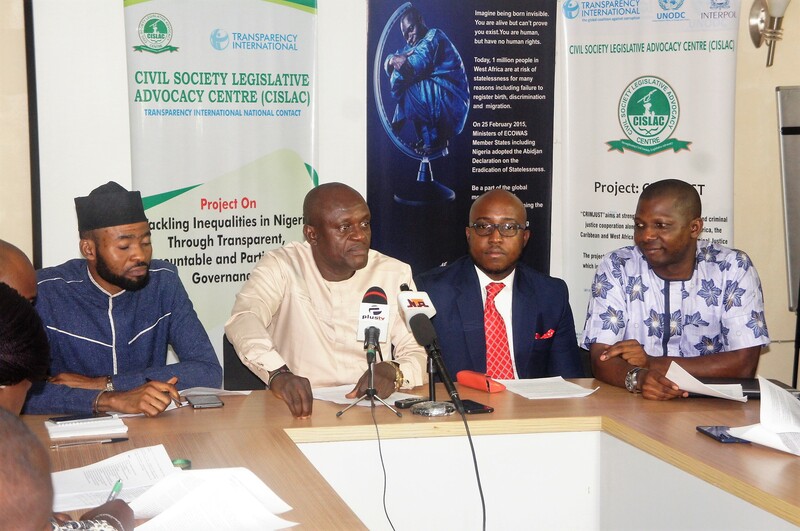 Nigerian public officials have been very quick to make numerous international commitments to tackle corruption and lack of transparency – 14 commitments were made as part of the Open Government Partnership effort. In some cases, a modest progress has been made. The World Bank Ease of Doing Business Index has improved due to concerted efforts of the government and the civil society. However, majority of the 14 commitments remain unfulfilled. 20 commitments were also made by the Buhari administration in London 2016 during an anti-corruption conference. One and half years later, not a single commitment has been completed. 50% of anti-corruption commitments are under-way while 25% are inactive. 25% of these commitments are in progress. Public contracting remains shrouded in chaos and lack of transparency. Beneficial Ownership register is nowhere near completion and crucial asset recovery legislation such as the Proceeds of Crime Bill has been hopelessly stalled in the National Assembly. The pledge to work towards full implementation of the Open Contracting Data Standard has not resulted in tangible actions and the much needed public procurement reform is stalled as key appointments for National Procurement Council (NPC) have not commenced. Furthermore, the National Assembly has delayed the confirmation of 60 nominees for leadership positions across various institutions, including agencies vital to fighting corruption. The failure to screen and confirm nominees from the Executive is undermining governance and complicating the on-going fight against corruption in the country. The above mentioned failures contribute to the deterioration of public patience and perception about the ability to fight corruption in Nigeria. Unless the Justice system expedites politically exposed cases and forfeits meaningful amounts of recovered assets; unless the National Assembly stops political boycott of key appointments and passes much needed legislation, and unless there is a tangible strategy of the government to damage-control shocking plundering of public resources, public perception on anti-corruption is unlikely to improve. There is a reason to suspect that the Judiciary is either not able or willing to prosecute the VIP cases of senior public servants and elected politicians who have either directly plundered lucrative Nigerian state resources or are at least responsible for the catastrophic lack of oversight over public funds as mandated by the Constitution. Indeed, huge deposits of oil and gas continue being a curse for Nigeria instead of a blessing. Monumental corruption and kleptocratic governance have brought Nigeria in 2018 to the nation with the highest number of people living under extreme poverty level in the world! How ironic it is that while around 116 million of Nigerians live on less than 1.25 USD a day, Nigeria recorded 23 billionaires with collective wealth reaching almost 78billion USD and 43 000 individuals owning assets worth at least 1 million USD in 2016. Despite some acceleration in the rate of repatriation and confiscation of the proceeds of corruption, we still do not see the investigations, prosecutions and convictions at the highest levels of our political class. Also despite some indisputable evidence, many corrupt politicians and businessmen and women seem to be above the law and out of reach of law enforcement. A report by the Economic Financial Crimes Commission (EFCC) claims that in 2016/17, 286 cases were brought to conviction, which would signal a remarkable improvement to 53 convicted cases in 2012 out of 353 court proceedings. However, this nominal improvement disguises the fact that Politically Exposed Persons (PEPs) have been too often acquitted on dubious grounds. This is unfortunately not specific to Nigeria; developing and developed countries battle the same crisis on consciousness and rule of law in this matter. Nigeria still loses enormous amount of resources to illicit financial outflows. It is estimated that around 35 billion USD are annually lost to illicit financial flows. These indirect and dodgy movements of monies earned in Nigeria and leaving the country through the back door poses great challenge to our development and economy. It is therefore astonishing to note that Nigeria’s newly independent Financial Intelligence Unit has been able to secure one single conviction in 2017 out of the 3587 Suspicious Transactions Reports which banks and financial providers flag as potential money laundering cases. This year, and approaching elections in 2019, should be a wake-up call for unprecedented rise in insecurity and gradual sliding of the rule of law in many parts of Nigeria. More and faster progress needs to be made to curb arms trafficking and organised crime. Nigeria still receives around 70% of the estimated 500 million illicit weapons inflow to Africa yearly. Due to the secretive nature of defence budgets and insufficient oversight of law enforcement agencies, the Nigeria Police and military have a reputation of heavy-handedness and poor respect for the rule of law. Complete lack of transparency in the procurement of military equipment, overpricing, purchase of obsolete and dysfunctional weapons, etc. are symptoms of estimated loss of 15 billion USD in the defence budget between 2000 and 2015. Despite nearly 500% of increased military budgets over the last decade, front line troops still complain about lack of equipment and resources to combat insurgency. Corruption has literally killed tens of thousands of people across Nigeria due to corruption in the security sector. Some defence budgetary allocations may even directly contribute to insecurity and lawlessness. For example, the so-called ‘Security votes’ are one of the most durable forms of corruption that exists in Nigeria. The total Security Vote spent is N241.4 billion Naira, which is more than the annual budget of the Nigerian Army, more than the annual budget of the Nigerian Air Force and Navy combined and more than 70% of the annual budget of the Nigerian Police Force. These vast sums are spent without the basic controls you would expect in a democracy, like transparency on their use, or audits. They are hidden behind a veil of secrecy that serves to mask all sorts of sins. In some cases, the findings on this expenditure line are almost laughable. The expenditures include: The Federal School of Dental Technology and Therapy in Enugu which received $2,800, The National Institute of Hospitality and Tourism Development Studies received N5, 668, 635 or in Bayelsa State, funds went to the Special Advisor for Beautification. The above were mentioned as money spent on security vote. It is a few months before presidential, gubernatorial and legislative elections, therefore the call for integrity and transparency of elected representatives and public officials need to be heard as never before. Despite rhetoric of successive governments, serving politicians and senior public servants use public treasury as a personal Automated Teller Machine (ATM). The movement of individuals between public office and the private sector is still not regulated. The absence of ‘revolving door’ policy, which may introduce ‘cooling off’ periods between retirement of senior public officials and subsequent employment in private sector, makes collusion between public and private sector individuals too easy. Legal provisions in regards to the asset disclosure need to be respected in full, including the revision of the legal framework so that sanctions are proportionate and not dissuasive. Asset declaration for elected officials, senior public servants and judges need to be re-classified as public documents and be open to the scrutiny of the citizenry. As of now, asset declaration has not brought any added value to checkmating grand corruption. One of most fundamental governance problems in Nigeria comes with extreme corruption in the political party system. The electoral processes at the federal and sub-national level need to be free of political profiteering and manipulation. The Independent National Electoral Commission (INEC) must possess the independence and capacity to sanction breaches of the provisions of the National Electoral Act, 2010 as amended. The political parties’ financing is prone to undue influence of wealthy ‘godfathers’ who circumvent the rules put in place by the Electoral Law. To curtail these abuses, a strict supervision and effective sanctioning are needed in conjunction with the pressure from the ‘grass-root’ for respectable candidates with high personal integrity and moral standing. The challenging context and work done by media, anti-corruption agencies, law enforcers, whistle blowers and honest public servants must be acknowledged and recognised. These actors put their lives at risk for a pittance. Anti-corruption agents and civil society activists do not enjoy necessary level of protection and unanimous political support. Numbers of law enforcers, activists and journalists killed in the line of duty are sad reminders of the daily reality and uneasy choices for many of us.  Cases in court that deal with PEPs should be expedited and cases should not be thrown out on technicalities that hinder the judiciary from carrying out their judicial responsibilities.  Investigation should be carried out especially where there is evidence of abuse of power by political leaders.  The NFIU should be proactive by following up on the Suspicious Transactions Reports which banks and financial providers flag as potential money laundering cases.  Our security agencies and personnel should be equipped to defend the nation and porous borders that allow inflow of illicit weapons and money laundering.  There should be adequate transparency in the procurement of military equipment as necessary.  Asset declaration for elected officials, senior public servants and judges should be in the public domain and be open to the scrutiny of the citizens.  The electoral processes at the federal and sub-national level need to be free of political profiteering and manipulation. The Independent National Electoral Commission (INEC) should set up mechanisms of monitoring section 91 of the Electoral Act 2010 As Amended that deals with maximum limit of election expenses. In conclusion, Civil Society Organisations will continue to support the government’s effort and ensure they walk their talk in the fight against corruption. We also remain resolute in ensuring that the government carries out their oversight functions for the benefit of its citizens.